Heat oil till hot, drop in shallots and fry at medium heat till golden brown, take the shallots out and remove the oil separately. - Leave about 1 tbsp of the frying oil in the pan. Put in the aromatics, galangal, lemon grass, chilli, garlic, star anise, peppercorns. Stir fry for couple of minutes till fragrant. Add turmeric powder and lime leaves, a quick stir then popped in the quartered onion and stock. Bring to a boil. Add chicken pieces and simmer gently for about 20 minutes or till chicken is cooked. Add salt or fish sauce to taste. - Remove chicken to cool. Then shred. - Strain the broth. Skimmed off most of the floating fat. Return to the pan and bring to a boil. - In another pan, add boiling water and pressed rice cubes to heat through for couple of minutes. Remove rice cubes and place on serving bowls. Throw in the beansprouts and blanch quickly. Remove and scatter over rice cubes. - Pour boiling broth onto each serving bowl. - Sprinkle on shredded chicken, chopped spring onion and coriander, fried shallots, chopped chilli, pineapple and decorate with sprigs of mint. This recipe is a quick method. Traditional ketupat is made with raw rice filled in a weaved container made with coconut leaves and boil. Cook some rice as normal by absorption method. While the rice is still hot, mash with a potato masher. The rice will get stiffer as you mash. Mash till it is no longer grainy and quite smooth. Line a container with cling film with extra overhang. Spread the mashed rice to mould the container, pressing down with a spatula. Fold over the cling flim, press the rice cake with finger to ensure no air gap and even on top. Tip the rice cake out with the cling film. Press with something heavy. Like in the slide show, I used a bread tin then a bowlful of fruits which happened to be the heaviest object on my worktop at the time. Press for about 15 - 20 minutes. Leave in fridge till ready to use. Will keep for a day or two in fridge. 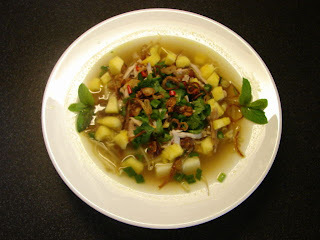 * Though pressed rice cubes are traditional, many people prefer rice vermicelli with soto ayam.